"Shake Shack sprouted from a hot dog cart in Madison Square Park in Manhattan [...] to support the Madison Square Park Conservancy’s first art installation. [...] In 2004, (they) opened a permanent kiosk in the Park: Shake Shack was born. This modern day “roadside” burger stand serves up the most delicious burgers, hot dogs, frozen custard, shakes, beer, wine and more. An instant neighborhood fixture, Shake Shack welcomed people from all over the city, country and world who gathered together to enjoy fresh, simple, high-quality versions of the classics in a majestic setting. The rest, as they say, is burger history." It was 2011 when I first discovered Shake Shack. I have moved to Manhattan from Chicago and was living in the Upper West Side. My roommate had been raving about this New York staple that I had to go to. Within the first few days of moving to NYC, I made my first trip to Shake Shack on Columbus Avenue and my life was forever changed. So at first glance, it is hard to believe that waiting in a 20+ minute line for a burger and fries seems worth it. Trust me, I moved to New York in January and was forced to stand in line outside in the cold waiting for my turn to order. But the million dollar question...was it worth it? Yes. 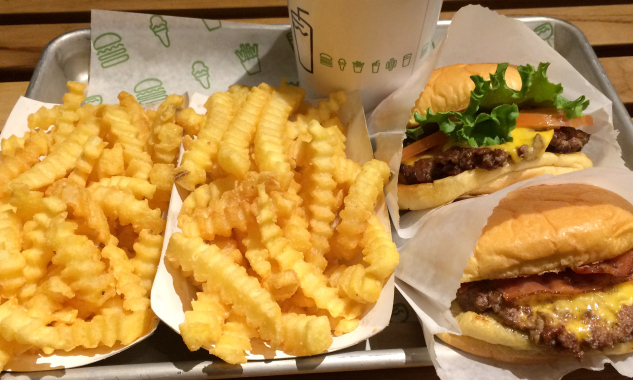 Shake Shack is to New York what In-And-Out Burger is the California. At the end of the day, are you getting anything more than just a burger and fries? Not really. But that is not what matters. What matters is the experience. The chance to witness an institution succeed and thrive. The chance to eat an incredibly delicious, although most likely not healthy for you, burger. When Shake Shack announced that it would be opening its first Chicago location in the fall of 2014, I was ecstatic. Finally, my friends in the Midwest would get to try what I have been talking about. Finally, I would be able to actually go eat a burger and fries from Shake Shack instead of simply dreaming about it. My brother and I attended a fashion event at The Roof at The Wit Hotel a few weeks ago. Although we had a few drinks and things to eat while at the event, we had it in our minds that we were going to have a burger at SS. There was no ifs ands or buts. To our delight, the line was rather short and moved incredibly quickly. As I took the first bite, I knew that all would be right in the world. Even better, I knew that I would be soon starting a new job on Michigan Avenue and would be within walking distance to the restaurant.